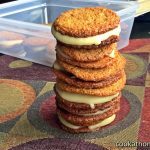 Paleo-friendly ginger cream sandwich cookies – for those times when you want something extra (but no refined sugar) with ginger cookies! Question for you all – how do you make ginger cookies, that are already awesome, into something even better? Well, if you’re me, you sandwich them together with some homemade coconut cream to make sandwich cookies. These ginger cream sandwich cookies are gluten and dairy-free, sweetened only with honey, and take my ginger cookie recipe up to the next level … with style! I keep seeing posts on social media using coconut butter, and I have to confess, I have never been a big fan of it before. It just didn’t seem to have the same texture or taste that I liked with all the other nut butters. Probably because it’s made with coconuts, not tree nuts (duh me!). But one thing that really put me off of coconut butter was how hard it solidified in the jar. It is really difficult to get a spoon in there to scoop out some coconut butter … and that just wasn’t good for me! And then I thought, why don’t I try to soften it in the microwave. Now, I don’t’ recommend this course of action if your coconut butter jar has any metal in it, but if it doesn’t, microwave it for about 30 seconds and see how you go. Nowadays, I soften the whole jar in the microwave until I can scoop out what I want, then if I find it solidifying when I’m baking, I’ll microwave it again. But that’s a little off topic. It’s the Christmas season again, where ginger everything starts to be shown everywhere. And I wanted to jazz up my ginger cookies recipe a little bit. I love this recipe and use it as the base of my pumpkin pie (which is also a hit around this time of year! ), but then I got to thinking – what if I made a filling and made the ginger cookies into a little sandwich? And, I gotta tell you, everyone who has had these have loved them. So much so, that one guy at work, who swore to me he wasn’t a desserts-type person, went back for seconds when I brought them in! 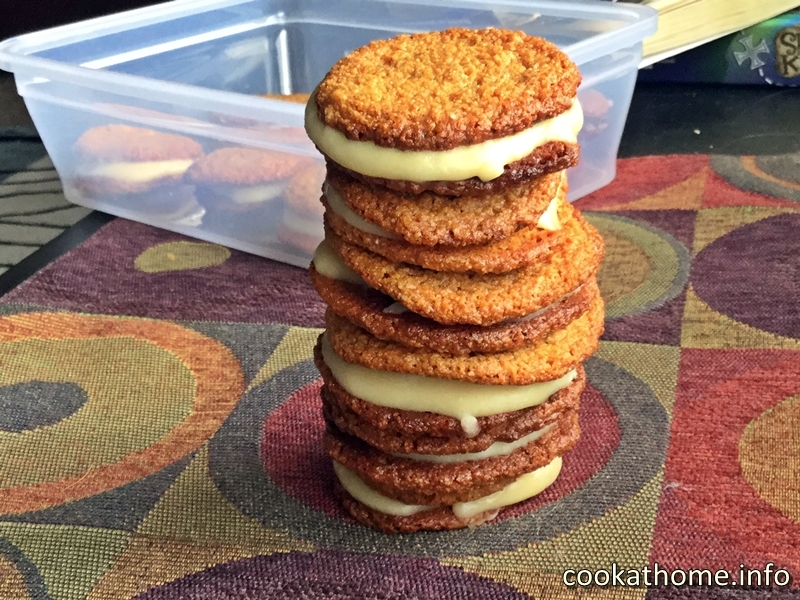 If these ginger cream sandwich cookies are considered to be that good, you’ve gotta try this recipe. You just gotta! In a large bowl combine the almond flour, baking soda and ginger. In a medium bowl, combine the oil, molasses, honey and lemon zest. Mix the wet ingredients into the dry. Scoop 1 tsp of dough at a time onto a parchment paper lined baking sheet. Be warned, these spread! Bake at 350F for 7 mins. Allow to cool on pan before moving to cooling rack. Combine all the ingredients together until well mixed. If too stiff to spread, microwave in 10 second increments until desired runniness is achieved. To assemble - spoon 1 tsp filling on the base of one cookie and sandwich another, similar sized cookie on top. Store in the refrigerator until the coconut butter hardens again, then can be left at room temperature for 3-4 days. Wow such simple yet yummy ingredients. It always amazes me what you come up with. Can’t wait to try these! Thank you for your encouragement – I’d be happy to make some for you if you’d wish!